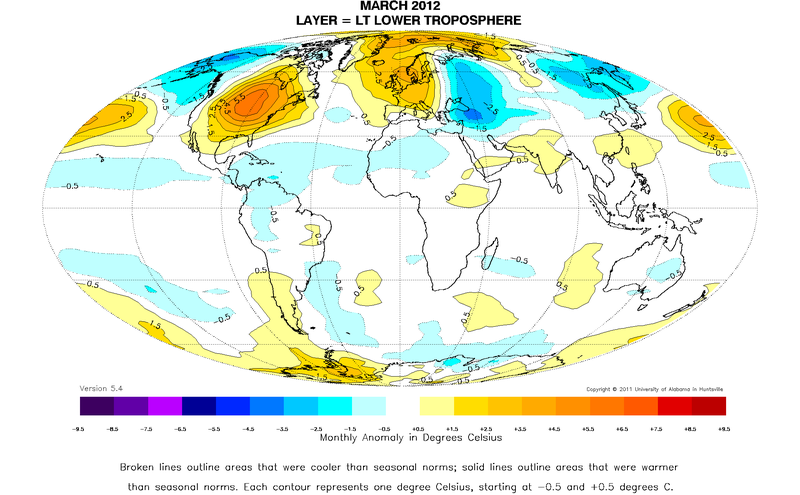 March 2012 Global Temperatur​e Report From The University Of Alabama At Huntsville | Climate Science: Roger Pielke Sr.
Phil Gentry has alerted us to the March 2012 Global Temperature Report. It is presented below. Global composite temp. : +0.11 C (about 0.20 degrees Fahrenheit) above 30-year average for March. Northern Hemisphere: +0.13 C (about 0.23 degrees Fahrenheit) above 30-year average for March. Southern Hemisphere: +0.09 C (about 0.16 degrees Fahrenheit) above 30-year average for March. Tropics: -0.11 C (about 0.20 degrees Fahrenheit) below 30-year average for March. Compared to seasonal norms, March 2012 was the warmest month on record in the 48 contiguous U.S. states, according to Dr. John Christy, a professor of atmospheric science and director of the Earth System Science Center at The University of Alabama in Huntsville. Temperatures over the U.S. averaged 2.82 C (almost 5.1° Fahrenheit) warmer than normal in March. The previous U.S. record warm anomaly in the 33-year satellite temperature record was in November 1999, when temperatures over the U.S. averaged 2.22 C (about 4° F) warmer than the seasonal norm for November. The next warmest March was in 2007, when temperatures over the U.S. were 2.0 C (about 3.2° F) warmer than normal. In fact, the warmest spot on the globe in March (compared to seasonal norms) was northeastern Iowa, where temperatures for the month averaged 6.20 C (about 11.2° F) warmer than normal. By comparison, the winter (DJF) of 2011-2012 averaged 0.94 C (about 1.7° F) warmer than seasonal norms for the continental U.S. In recent years March has not typically seen temperature extremes over the U.S. The March 2011 temperature for the “lower 48” was at the seasonal norm. The coolest spot on Earth in March 2012 was northwestern Alaska, where temperatures averaged 3.89 C (7.0° F) colder than normal. As part of an ongoing joint project between UAHuntsville, NOAA and NASA, John Christy, a professor of atmospheric science and director of the Earth System Science Center (ESSC) at The University of Alabama in Huntsville, and Dr. Roy Spencer, an ESSC principal scientist, use data gathered by advanced microwave sounding units on NOAA and NASA satellites to get accurate temperature readings for almost all regions of the Earth. This includes remote desert, ocean and rain forest areas where reliable climate data are not otherwise available.